ZACK SMITH PHOTOGRAPHY - Zack Smith Photography Current Shows! Yep that's me, I tell stories and take pictures. You can currently see a few of my ongoing collections at these fine establishments. 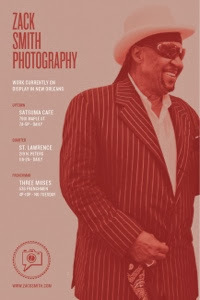 I am excited to be showing my Voodoo Fest portraits from 2008-2012 at St. Lawrence, Chaz Fest Portraits at Three Muses, and Musician Portraits at Satsuma Cafe uptown! Great poster design by the one and only Scott Campbell.